Canon 5D III, Sigma 14mm f/2.8 at f/1.8, 1/100th. This shot cost approximately £600 in sensor cleaning and lens repair. Every time the wind blows across the top of Secret Canyon – which is does every few minutes at 40 miles per hour – it blows a shower of sand over everything below. And director Leigh. And producer Liam. And videographer Alister. And – rough guess – fifty grands’ worth of top end stills and video equipment, all getting covered in grit and sand. Alister Chapman taking reasonable precautions. I generously didn’t charge him for the loan of one of my brollies. We were there to shoot some of the most amazing scenery America has to offer, in the slot canyons of Arizona. 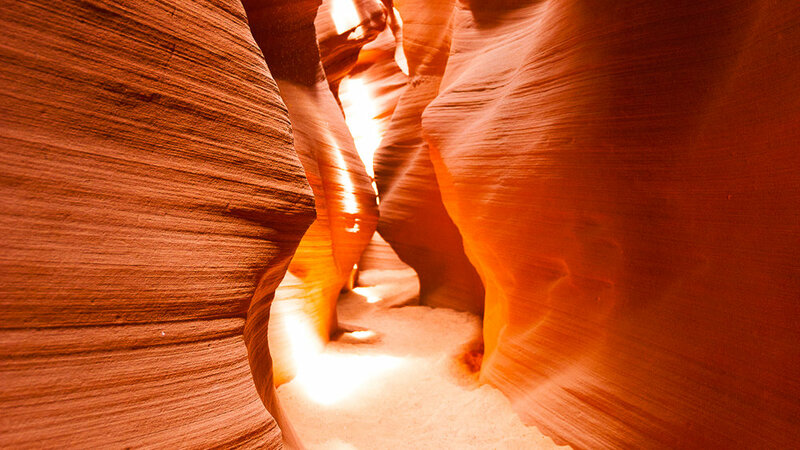 There are two ways to shoot slot canyons: the first is to pay your ten bucks and join the throng of tourists in places like Lower Antelope Canyon. LAC is an amazing place and highly recommended – there are absolutely loads of great shots there and just because there are other people around won’t stop you getting good stuff. 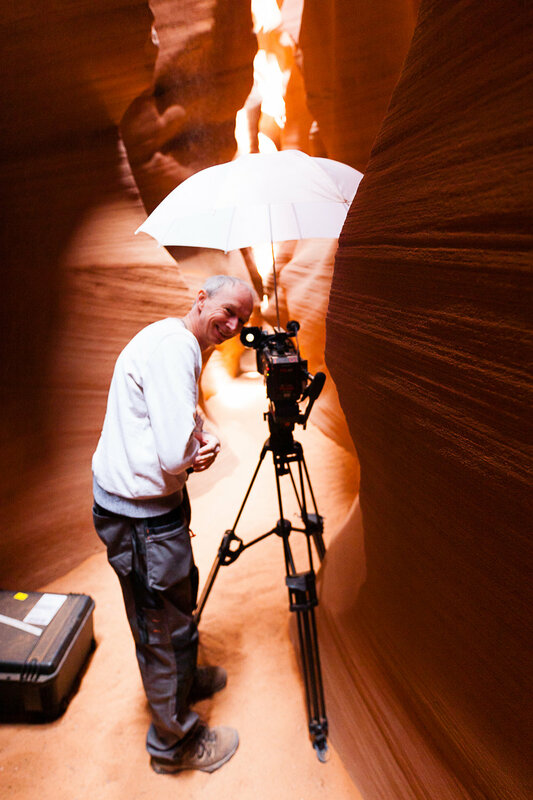 Still, we’d been commissioned by Philips to shoot moving and still images to help it shift its line of ever-posher TV sets, so we couldn’t really risk tripping over tourists, so we went the other route: hire out an entire slot canyon, and have the whole place to yourself. The slot canyon in question was Secret Canyon, so-called because it’s not sign-posted, and the only way to get there is to hike half a mile after driving several more miles over loose sand and slickrock. What followed was one of the most amazing shooting experiences of my career. Everywhere you looked there were new angles; every angle you thought you’d shot would change with the light, with beams appearing and vanishing in seconds. It was an incredible, improvisational experience. Our fixer in Secret Canon. She held still for 1.6 seconds for this exposure and I’m grateful to her for doing so. f/9 on Canon 24-105mm f/4. And it was followed by something even better. 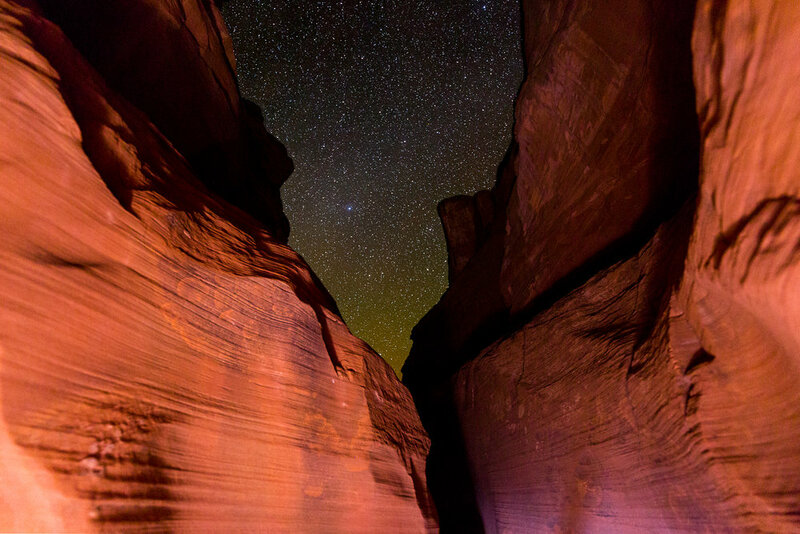 Shooting the slot canyons at night is very tricky – it’s specialised access you can’t get as a punter, so learning that we were going to shoot star trails at midnight was incredibly exciting. Secret Canyon at night. Canon 5D III with 14mm f/1.8 at f/1.8. 20 second exposure at ISO 4000. And also really, really difficult. Nighttime photography is hard enough: getting enough sharp in the shot so people can see what you’re doing, shooting at low enough ISOs that your images aren’t crowded with noise but high enough that you don’t wobbly exposures or blurry stars and, in this case, making sure your exposure doesn’t just include the crystal clear, freezing desert sky but also the once-in-a-lifetime foreground. In the end I went for Sigma’s 14mm f/1.8 lens, and chose compositions that made the sky look like it was peering through a jagged tear in the rocks. At first I thought of lighting the rocks with proper (TM) camera flashes, but eventually plumped for lighting things with my good old Petzl head torch. I’ve since seen these shots on Philips’ Ambilight TVs (they commissioned the shoot and it would be churlish not to mention them) and the combo of great colours and deep blacks made the most convincing argument yet that my current TV should meet a mysterious accident so an OLED model can come in. Canon 5D III with 14mm f/1.8 at f/1.8. 20 second exposure at ISO 4000. 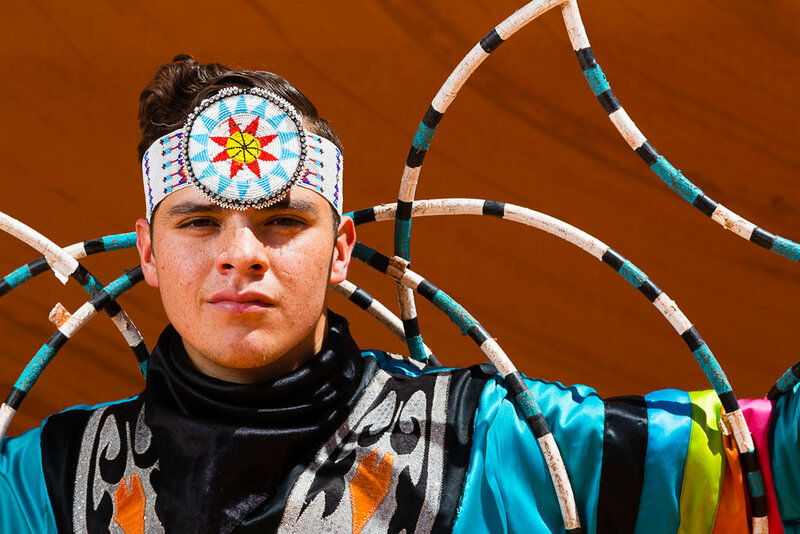 The next day brought another first for me: working with and shooting portraits of local Navajo dancers. Hoop dancing is pretty special – dancers get their entire bodies through a series of hoops, often one after another after another. It’s really athletic, physical work, and the stuff that got filmed – particularly what Dustin Farrell shot on his Phantom Flex 4K camera at a thousand frames per second – looks incredible. Bear in mind these chaps were a few inches from a thousand-foot drop while they were doing this. The marvellous Tomas Hunt. Canon 5D III with 24-105mm f/4 at f/14 and 1/100th of a second. Off-camera strobe in an octobox, wielded by art director Paul. For me, I was a kid in a candy store – I loved shooting these headshots. Given the models, how they were dressed and the location, there wasn’t actually that much pressure, as almost anyone with a working shutter finger could have pulled it off. Just to be safe, I brought an 80cm Octobox and some wireless flash triggers to help out with the lighting. These were all done with my Canon 24-105mm at around f/11 (another good reason to use an external light: it lets you shoot smaller, sharper apertures) and as ever, that lens excels in its sweet spot. Thanks to the various crew members who tolerated me barking “UP A BIT" “LEFT A BIT” while holding my lightstands and simultaneously trying not to fall to their doom. 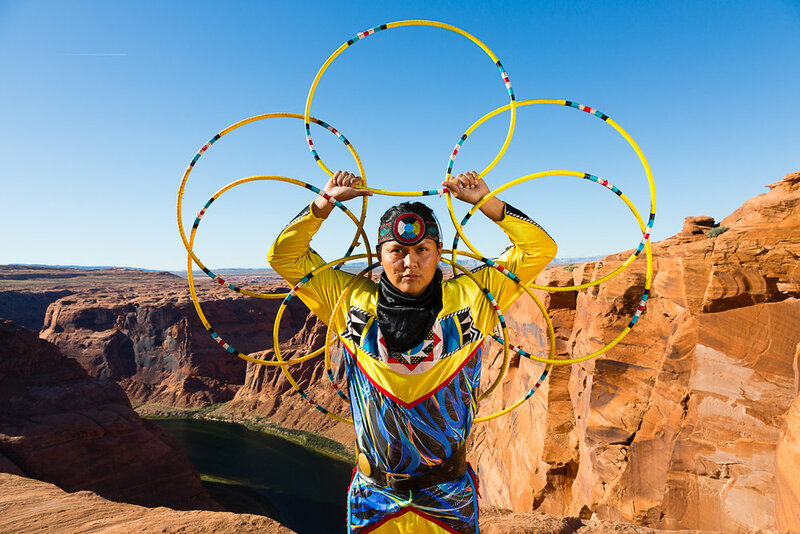 Native American hoop dancer Joseph Secody. Good looks, nerves of steel; the drop behind him is about a thousand feet. Canon 5D III, 24-105mm f/4 at f/11 and 1/100th of a second. Off-camera strobe in an octobox. What was interesting about this shoot was that I was involved in pitching it and crafting would it would ultimately be. Any time I get to do that, I pitch every good/fun idea I can, because you kind of know not everything will come off. Here, everything did. 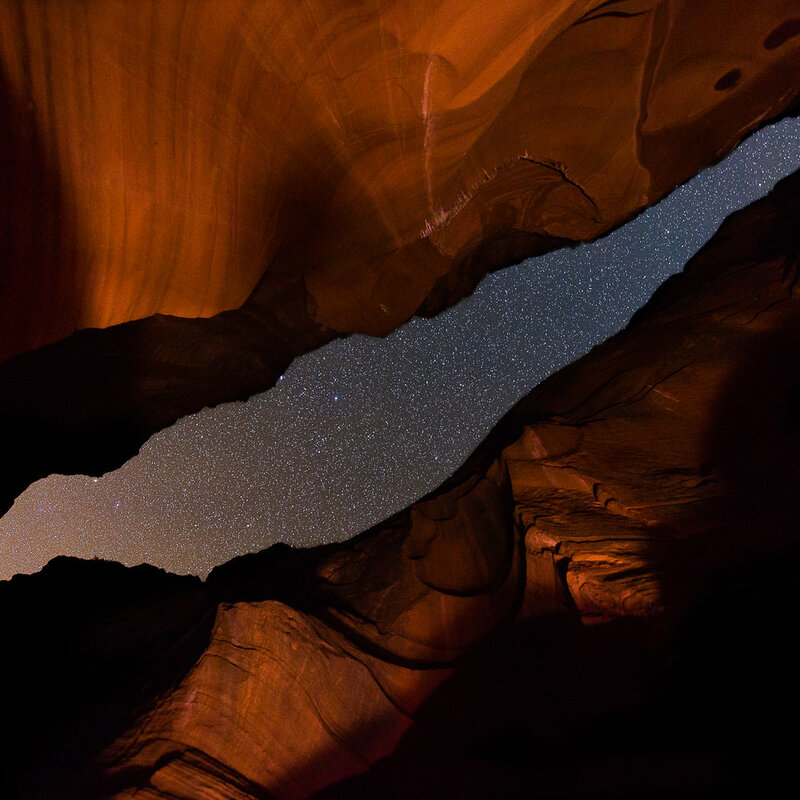 Night skies from a slot canyon? Check. Camping in the desert beneath an incredible Milky Way sky? Check. Dicking around in the desert in a Jeep Wrangler? Check. One excellent suggestion – I think this was Alister’s but am happy to be corrected – was to shoot Alstrom Point. Alstrom Point is only a few miles from the nearest town but can only be reached via a tricky off-road track. When we set off the weather was dire: a dust-storm was forecast, and those 40mph winds we’d so enjoyed at the bottom of Secret Canyon were picking up again, leaving us with the possibility that Alstrom Point would be impossible to photograph and possibly also very risky. We went anyway, with producer Leigh acting as chief-cheerleader. Possibly he was just bored of us that at that point and quite fancied seeing one or more of the team fall down a cliff. Thank Christ for that, we thought. Alstrom Point looked absolutely amazing in the late afternoon light, and any other tourists who were thinking of coming were scared off by the weather forecast. Lake Powell, hundreds of feat below, threw off light blue reflections which offset the deep red and orange hues of the towering rock formations above it. We actually shot well into the blue hour, which was when I got a good number of my favourite shots. The final job was cast and crew headshots, and where better to do that than Vegas? 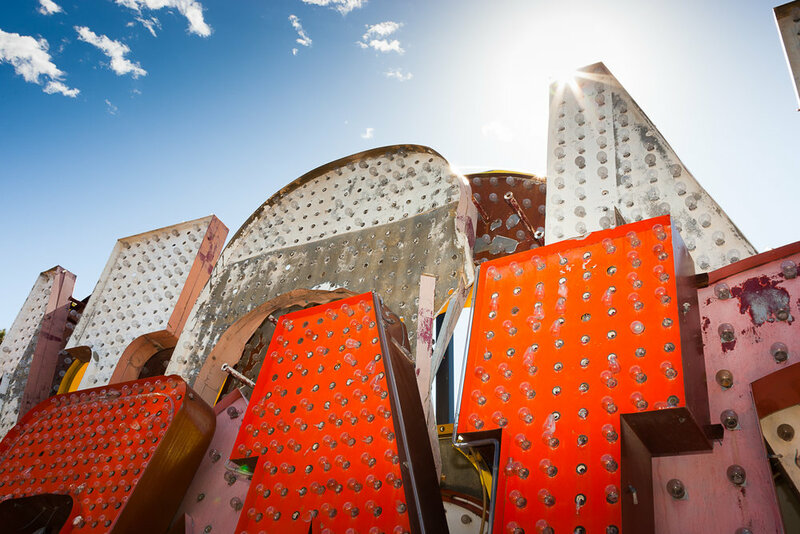 I’m not particularly a Vegas guy, but I did like the idea of shooting in a museum of disused neon signs, now retired from their job of luring punters into casinos. I pitched it in the run up to the trip and was thrilled when it got picked up. These head shots were again shot with my 24-105 and a strobe in a softbox. This was an amazing shoot. I’d shot in the area before, but not with the kind of access that only a big commercial project can get you. 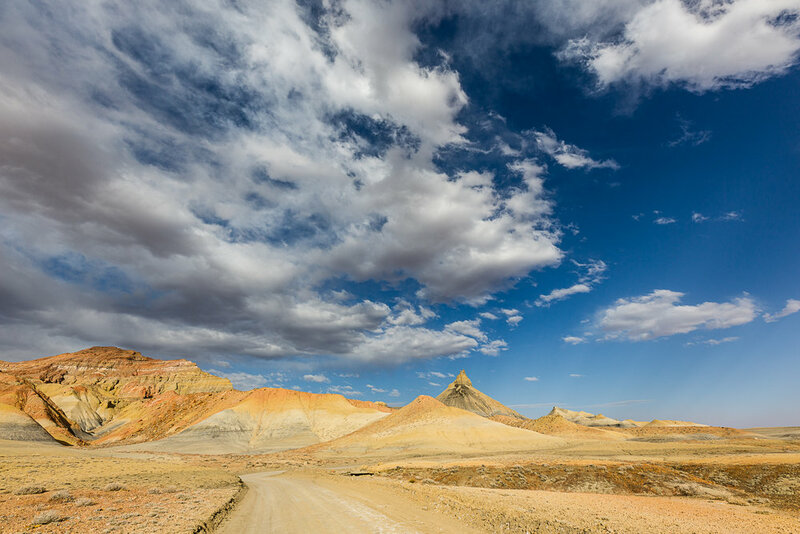 I love the end results, both my stills and the film that was made – I think it’s a really great showcase not just for Philips’ TVs but for northern Arizona as well, which is fast becoming one of my favourite bits of America. Where did all this end up? If you’ve seen a Philips TV in a store you might have seen this film playing, and if you were at IFA in 2018 you’ll have seen my mug emerging from a slot canon about a million times. If you’re unlucky enough to have missed either of those, man, do I have good news for you. And, because frankly I think making-of films are almost always as cool as the thing that actually got made, here’s the Making Of.